Versatile enough for use on almost any substrate, including canvas, wood, masonry, and even glass, Liquitex Professional Spray Paint is fully intermixable with other Liquitex ranges. Use it on its own, as a base or on top of Liquitex Heavy Body and Soft Body Acrylics, or for working wet-on-wet to create a variety of effects. Liquitex Professional Spray Paint can be cleaned up with water when wet, yet it dries to a tough, permanent finish. 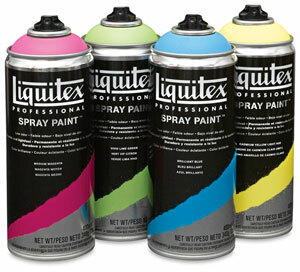 To view a PDF showing Liquitex Spray Paint Use and Care, please click here. Liquitex Professional Spray Paint is made with artist-quality pigments and is waterbased, making it very low odor compared to high-solvent spray paints. Therefore it should be noted that a waterbased acrylic spray can clog a bit more easily than a high-solvent can when precautions are not taken. Please follow a few simple guidelines to prevent caps from clogging. Shake the can very well before use (approximately 2-3 minutes) and continue to shake the can regularly while using. When finished working, turn the can upside down and spray until the output runs clear. Then wipe the cap opening and replace the cap. When finished with a particular can, it can help to wipe the cap, pull it off, and keep it in a bowl of water until needed again — this does a great job of preventing clogs. If your cap is still clogging, you can soak it in warm, soapy water. However please remember that spray caps are not meant to last indefinitely. If a cap does clog, do not continue pressing as this will cause a buildup. If this should occur, remove the cap and clear the well underneath the cap with water. Using a fat cap should then clear everything properly.